My apartment is full of books, and I like it that way. I like that I have to move books out of the way when guests come over, and I like that they are as present in each room as any of the furniture. If my print books are going to take over my living room, well, that’s fine with me. What isn’t fine with me, though, is that I started to notice that the books taking over aren’t books I particularly care about, or have even read. I want to collect books, I don’t want to hoard them. I thought that keeping my TBR pile on the bookshelf in my bedroom where I would see them every day would make me more likely to read those books, but instead it meant that the books I kept closest to me were books I didn’t care about. So, I had two goals in spring-cleaning my books: the first was to reduce some of the clutter in my apartment by getting rid of books I don’t need, and the second was to reorganize my books so I kept important books close and knew where to find the rest. My book storage situation is a little unique in that while some of my books are an an actual book shelf, the some are around my apartment on various ledges, and most of them are on an unused staircase from back when my apartment was part of a single-family house. The books on random ledges are actually pretty orderly, so I spent most of my energy on the bookshelf and bookstairs. 1) Find yourself something to listen to. This is going to take a while and you don’t want to get bored and end up with piles of books that you forgot about because you just wanted to read that one passage…and whoops it is tomorrow and you never got your books organized. So get yourself an audiobook or a podcast or some music before you start. 2) Do a quick first pass over all your books and pull out any you know need to go. I was amazed at how many books I was excited to get rid of without too much thought. Go with your gut on this step. It’s just the first pass. 3) Start four piles: books you want to sell, books you want to donate, books you want to give away, and books you want to return. I took most of my culled books to Half Price Books to make some book money back, but I had quite a few that I can’t sell either because they are ARCs or because I got them from work, so those go in the donate pile. I also have plenty of books that aren’t for me, but I know someone else who would like it. I also (womp womp) have some books I have borrowed and which I should return to their loving homes. 4) Go over your books more carefully and decide what to keep and what to get rid of. …you have read but which you don’t like. …you read but which you know you won’t read again. …you know you’ll never read. …that have bad memories tied to them or just make you unhappy to have around. …you read and loved and will read again. …that have special memories tied to them. …that are pretty and that you want for decoration. …you know you will want to loan out. …that felt like an accomplishment to read. …that were given to you by friends. …that were written by friends. …you just don’t want to get rid of. The point here isn’t to clear out shelves for the sake of clearing out shelves, but to make the books you want easier to find and make room for new books. 5) Decide how you want to categorize your books. I went with very loose categories to begin with, and as I started putting books back on shelves, I let new categories naturally form. I knew I wanted to put books I cared about on the shelf in my bedroom, so I collected all of my Louisa May Alcott books and put them on their own shelf. Then I grabbed the other books that had been important to me in my childhood and gave them their own shelf. Harry Potter got most of one shelf, and then I filled up the rest of the shelf with a box for CDs and computer games and a couple Bibles. On the bookstairs, it made sense to sort books by genre, and then break up the biggest category (fiction) geographically. So, I have a shelves for mysteries, biographies and memoirs, comics, travel and foreign language, and then American, British, and world lit. That’s just what I did: you can also organize your shelves alphabetically by author, by BISAC codes, by color, in descending order of how much you like each book, whatever. 6) Buy supplies. Once I had my books in order, I realized I needed to buy a few things to help me keep that order. I thought about getting some adorable bookends, but in the end went for some cheap and utilitarian ones. I also grabbed a couple magazine boxes for magazines and comics. (I got these, but Target also has some in their dollar section right now. I love the dollar section.) I also grabbed a box for book-sized odds and ends that always end up on my shelves but don’t belong there, like computer games. 7) Wait, and then haul off your books. One of the best things I did was wait a few days before selling and donating my books. In that time, I added a few more books to the pile, and also took a few out to put back on my shelves. I sold most of my culled books to pay for the bookends and magazine boxes, but you could also donate your books to the library, donate them to a literacy organization, or check out one of the ideas on this handy list. I finally know where everything’s at, and it’s in an order that’s uncomplicated enough that I can keep it up. What are your best tips for reorganizing? 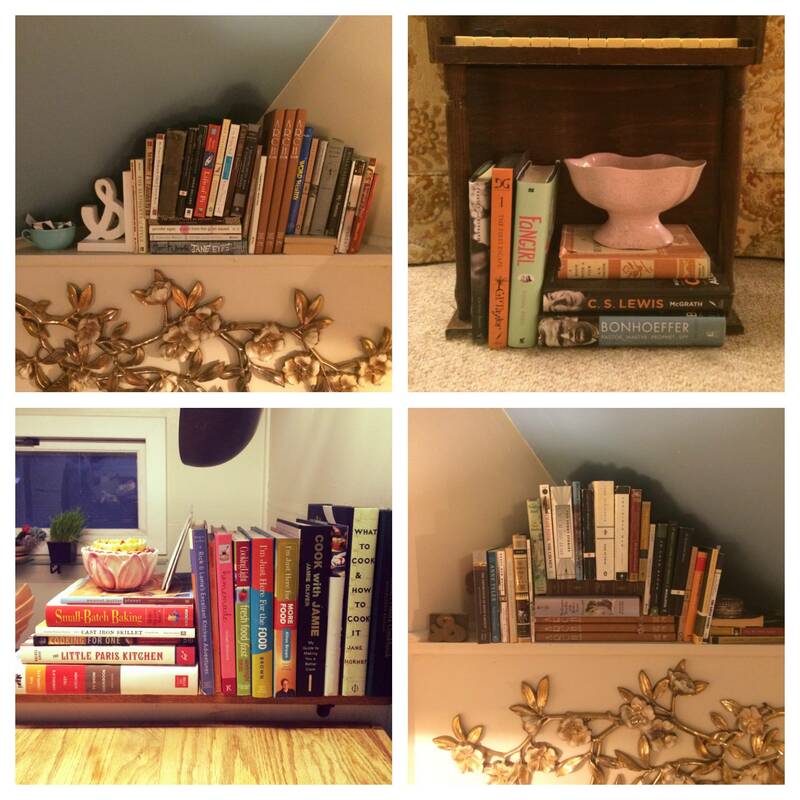 Do you have any unusual places where you keep your books? Let me know in the comments! And once you’ve got a nice donate pile, come to our (multi-city) BYOB book swap/drive on April 23rd and donate them to charity and maybe pick up some new-to-you books!